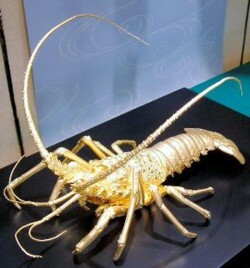 A golden lobster has been placed on display at the Ginza Tanaka jewelry store in Nagoya. Crafted from 500 grams (1.1 lb.) of pure gold, the creature is a detailed life-sized reproduction of an Ise-ebi lobster (Japanese spiny lobster, or Panulirus japonicus). It measures 34 cm (13 in.) long and 19 cm (7 in.) tall. The asking price is 5 million yen (about US$40,000). Ise-ebi lobsters are often bestowed as gifts on special occasions in Japan. According to a shop attendant, this golden crustacean can serve as both a celebratory offering and a good luck talisman. Customers react in various ways when they see the realistic-looking golden lobster. Some of them say they expect it to start moving, while others say it looks delicious.